Our current adventure is reviving the old well. We have a nice ninety footer with a 220 volt jet pump, but when the power is down, no water! The water table is only about 23 feet hereabouts, and most of the wells have been driven to 33 feet. We were clearing blackberries fifteen years ago, and found one of these, apparently abandoned, just behind the barn (not the best location, to be sure), and when we added a tiny greenhouse, made up mostly of three sliding glass doors, to the potting-shed end of the barn, the well platform became the floor of the sunny end of the greenhouse, and remained undisturbed from then until now. Lately I noticed that the two-by-four frame of the greenhouse windows is rotting at the ends, so this seemed a good opportunity to work on the well. It had a jet-pump system at one time, and the two pipes, suspended from the top of the well casing, had been sawn off and posed a difficulty in getting a new foot valve and flexpipe down to the water. I would need to raise the pipes, but had put this off while the windows were in the way. Now I took them off and stacked them against a willow tree, set a multi-position ladder in folded configuration above the well, hung a chain around the ladder about 2/3 of the way up, hung a come-along from the chain, tied a rope securely, wound around several times for the sake of available friction, round the two pipes, hung the looped ends of the rope from the bottom hook of the come-along, and cranked. Everything groaned a little as the slack was taken up, and then the pipes began to move, one quarter of an inch per click. After the pipes had been raised two feet, I faced the issue of how to secure them without letting them crash back into the hole, so that I could unhook the come-along and reattach it to pull the pipes another two feet. I could use another rope, tied to the ladder, but might lose a few inches every time I had to reset, plus having to do quite a bit of untying and re-tying. This problem occupied me for about half an hour, but was solved as I rooted about in the garage: one of the many tools given to us by my parents and seldom used over the years, a chain vise-grip wrench. This works just like a vise-grip, but includes a length of motorcycle chain, intended to provide a grip on larger cylindrical objects. I last used it to remove a stubborn oil filter from a GMC truck -- or was it an International Travelall? -- twenty-five years or so ago. It worked very well for that -- overkill, really. The wrench made everything simple -- up to a point. Over the course of the day, whenever I had the energy, I would stand over the hole and crank. Ultimately, the pipes towered over me like a flagpole, and leaned suspiciously toward the chicken pen. No one at home --free range -- and I had chased away the curious hens, who were determined at first to examine my work while standing on my feet, but I didn't care for the idea of two hundred pounds of pipe crashing down through all of their nice wire netting. So I found another rope, and tied the pipes off to lead them in another direction, just as I've done sometimes with wayward trees. When the old foot-valve, slimy and dripping wet, cranked into view, I could see why the well had been abandoned. The 3/4 inch injection pipe had corroded through, and rather than go to the trouble of raising the pipes (which would have been inside a well-house at the time), the owners had simply drilled another well. I now had about four inches, or some sixteen clicks of the come-along, to go. This was beginning to make me nervous -- there was a lot of iron waving around in the sky now. I reset the wrench, the rope and the come-along, left the setup overnight, switched to making seven quarts of tomato puree -- not very successfully, as only three jars sealed. I had been impatient with the water-bath -- a no-no. So I froze the other four jars and went to bed. In the morning, I waited until after the dew had burned off (the day eventually went to 75 degrees -- on October 25! ), to give everything a chance for maximum friction. I cleared an escape route through the potting shed, checked around me to make sure my clothes would not catch on anything, grasped the handle of the come-along, and cranked slowly -- one click, two -- watching the base of the jetpipes intently. The foot valve was an old type, shaped like a coiled spring. No telling when the behemoth would let go and tip itself over. Click -- click -- click -- szloop -- out it goes! Eek! I backed away through the shed, but everything went as planned. Drawn by the tightened guy rope, the pipe assembly flung itself out into the pasture, with a most satisfactory "whump." I could now snake a garden hose down the well, fill it up and flush it out, and go shopping for some 1 1/4" flexpipe. In the afternoon, for a change of pace, I dibbled some broadbeans into the winter beds, kneeling on an old pillow stuffed into a feed sack. Gathered the last tomatoes, zucchinis, potatoes and eggplant ... pulled up all the summer-garden debris and piled it for the mower and bagger,then emptied the bag -- about six times -- onto the winter beds and the compost heaps ...took down all the beanpoles and stacked them for next year ... dumped out the tomato and potato container gardens into the wheelbarrow, and threw the container soil into the heaps and the compost barrel ... found a huge nightcrawler in the potting mix and parked it in a cottage cheese container while deciding whether to go fishing ... affirmative ... made a batch of spelt/apple/potato/Parmesan-cheese bread dough, divided it into two loaves to rise in the stoneware pans in the oven ... got out the miniyak ... went over to the reservoir ... yes, they were biting. ... had some, fresh-hot, with slices of Brandywine tomato from the vines hung upside down in the greenhouse ... went back out to the greenhouse and put a hose down the well with the new foot-valve on it ... brought up some water with a pitcher pump ... ugh, it's in foul shape. Brown, with more than a hint of sulfurous mercaptans. Not surprising when it's been thirty years since that well has been used. This could be something like that -- on a smaller scale -- it's a steel pipe, thirty-three feet deep and six inches wide, set in a concrete pad, open at the top, which revealed itself as I cleared blackberries behind the chicken shed, fifteen years ago. I had been told there was an earlier well than the one now in service, which had failed and been abandoned, and had wondered where it might be. We're interested in seeing if this one can be made to yield water again. Clearly it's going to take some doing. I have a high pressure nozzle, and maybe could put that on the end of the hose and flood the well, hopefully driving the yucky stuff out the top of the pipe and cleaning the perforations at depth enough to regain access to the water table. Even so, we probably can't drink this water without purifying it, and even then I might hesitate -- it's right in the middle of the barnyard -- but could be used for emergency irrigation. We're entirely dependent on electricity for our water and had six outages last year. We're between gasoline-powered generators at the moment, but I'd be happier to find another way to pump garden water, which we can't get from the creek because it doesn't run half the year. A rain barrel isn't a solution either, same reason, and a cistern is a lot of trouble and expense for what we'd get back from the effort, seems like. We'd also like to get water for household use from the newer ninety-foot well without having to depend on the 220 volt pump, but a full-sized solar immersion pump is too costly to consider, and a smaller siphon pump can't be installed with drilling into the well cap, which gets technical and which we're not willing to do. I'll ask our local pump company if there's a good way to lift water for ourselves without the 220 or gasoline, using the existing piping --we can't use the hand pump for this because that water's more than 25 feet deep in the four-inch pipe -- I think it is, anyway. It's a good well -- all the others in the neighborhood are 33-footers and in a drought year, back in the nineties, they started to run dry and people came to us with five-gallon buckets from several of the houses around. It felt good to have the life-giving stuff on offer. At our Coast Range place, there was a spring coming out of the ground right back about sixty feet behind the house. Skunk cabbages and ferns grew all around it. There was not much flow to speak of, but there was enough to encourage us to experiment. So we dug it out, to about the size of a bathtub across and a little deeper, and the hole filled overnight with clean, reasonably clear water; it looked to be about three or four gallons per hour. This was encouraging, so we put together the following system: one new thirty gallon trash can, galvanized, washed clean, punched with many, many holes with a hammer and a nail, and with a two-inch diameter hole chiseled into the lid, sunk into the spring up to lid height and surrounded by a lining of basalt stones (river rocks); one brass foot valve; seventy feet of 1 1/4" PVC flexpipe; one pitcher pump. We put the pipe in the ground alongside the house and then straight up into the kitchen, with the hand pump by the kitchen sink. There was no drain; a five-gallon bucket stood beneath the sink and was emptied onto the gardens regularly. it reminded her of her Wisconsin childhood! We built a little insulated springhouse over the spring, too, and milk and eggs and the like kept reasonably well there, year-round. The entire system, in 1979 dollars, cost less than three hundred dollars, including the springhouse. We won't have such an easy time of it here. But we'll keep after it in hopes of some improvement over the status quo. Click picture to enlarge enough to read the funky handwriting! On the right, garden plat. On the left, mostly freezer records. This is supposed to be the cold room, but it was seventy today and they expect similar weather all week. My son tells me I am a “disaster otaku.” Well, maybe. I’m in what is supposed to be one of the premier retirement plans on the planet (Oregon PERS) and it has lost a LOT of its value over the past two weeks. A one-day run-up of stocks hasn’t really signalled a stabilization. Growing and putting by food, adding insulation, finding alternative ways of getting at water and providing heat and lighting, putting away the credit card, paying ahead on and retiring debt, not eating out or going out to the movies or concerts, or paying for cable, or getting my hair done or shopping for style — these are strategies that seem worth while to me right now, along with getting to know neighbors, sharing rides, finding ways to get to and use public transit, and staycationing. I’m not even planning to get the DTV box — who needs it — We have a nice collection of old VHS and some newer DVDs, old vinyl records and a phonograph, some acoustic musical instruments, Scrabble, Monopoly, and books, books, books. And I have someone to read them to me while I shell beans. I've been experimenting with not riding around in motorboats, not skiing, not watching the Superbowl, and not hanging out in a mosh pit, and, so far, I'm still breathing. Think about it: home from work, recycled items in hand, via small-town bus, eat a few small Yukon Gold potatoes with sliced Roma tomatoes, change clothes, and go out and pull down bean poles, unwind dying runner bean vines from poles, stack poles, give vines to poultry, check later for de-leaved vines, feed vines to chipper, fork over the compost, come in for tea as the darkness gathers, wash your face and hands with hot water from atop the woodstove, read some more Kingsolver, brush out your hair, put on your nightgown, pull the blanket over you, touch your Beloved's cheek. It's all relatively inexpensive and sustainable. Avoid complications, and, to some extent, complications will, if the angels smile, avoid you -- for awhile. October 12 -- first frost. Mostly it hit the squash vines and the stevia. Everything else, even the tomato crop, seems to be soldiering on. 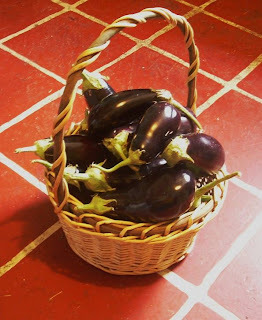 Nevertheless I took the hint, and gathered up the three most heavily green-tomato-laden vines -- a Brandywine and two Romas -- and hauled them to the potting shed to hang; we'll see what happens. I had brought in the basil plants and hung them up by the fire to dry the day before. All the remaining green tomatoes I brought in; I'm not fond of fried green tomatoes (except as a book) but I did make a green tomato pesto that I liked. Anything that's half-turned we set out on paper in a window to see if it will ripen; most do. There were a few zukes among the blasted squash leaves and I took those as well, and gathered the remaining sunflower heads and some bean vines for the poultry. It occurred to me that I haven't been making much mulch the last couple of months, so I got out the electric shredder and made about thirty pounds of chips from sunflower and pepper and sunchoke stalks. Earlier, after breakfast, I sat by the fire cutting open feed sacks to lay out flat and roll up. I've begun using them to create more dead air space in the tiny crawl space that serves here for an attic, along with bubble packs, styro peanuts, cardboard, and pretty much anything else we can get our hands on. It's a struggle to get up there as the hatchways are right up under the rafters and I have to squirm like a caterpillar to negotiate the opening. It's completely dark up there, so I've installed the trouble lamp to see for the time being. There's no floor; the ceiling fortunately is made of very sturdy one-by sixes nailed to the underside of the ceiling joists; but one has to negotiate the joists anyway to avoid roiling up the matted fiberglass insulation, only about two inches thick, between them. Beloved has been processing more apples, and planning storytime and music programs, and practicing guitar; so she's within hollering distance to pass things through the tiny hatch to me as as I run out of them. She says that I look like a big bug in my hoodie, mask, and goggles. Whatever. We've ordered a pitcher pump and a foot valve, and they have arrived, so when the attic is done, being able to get water when the power is off will be a priority. Then when it has rained enough to soften the ground some, we'll move the deer fence and start making the long permanent beds. GWATCDR (God-Willin'-And-The-Crick-Don't-Rise). So, that's us. What are you doing to ready up for winter? ... while it's raining cats 'n dogs (roof is good so far). Wrapping up my reportage for Independence Days, this first week of October. I fell for this useful and encouraging challenge because we'd met Carla Emery, who inspired it, back in the Seventies, and she was an inspiration to us as well. Beloved and I were treeplanters (well, I was, she was camp cook), working with the Hoedads, Inc., a reforestation cooperative that ranged the Northwest taking on reforestation jobs with Forest Service districts. We'd been working far up the North Fork of the Clearwater, near Headquarters, Idaho, and on our way to a new job on the Lochsa, stopped in Kendrick to find the storefront where a homesteader was said to be building a handmade homesteading book. All was just as we'd heard. There was Carla, with about five gossiping grey-haired local ladies, all circling slowly around a long table stocked with all the chapters of the mimeographed (can you believe it?) Old Fashioned Recipe Book, now in its ninth edition under the title Encyclopedia of Country Living. It was just like a quilting bee. As each got to the end of the table, the hole-punched chapters were jogged and bound by seated ladies who stuck heavy-gauge wire through the holes and wound the ends of the wires together, using pliers. We were enchanted, and fell into line behind Carla, chatting with her as we picked up chapters. What a way to publish a book! And what a great book. Our dog-eared, oil-besmeared copy of that edition went away, somewhere down the years (sigh), as did our copy of the eighth edition, but we have the ninth and we guard that one. Who knows when there will be another; Carla is no longer with us. No doubt she's somewhere, wrangling steers and chickens, sourdough and fencing, plumbing and roofing, in the Great Homestead Beyond. Plant Something: A peach pit in a pot on the windowsill. I got the peach from a retired lady volunteering at border information center in Iowa, and ate the peach, humming something Allman Brothers, as I entered Nebraska. Harvest Something -- Tomatoes: Brandywine, red cherry, orange cherry, yellow pear, salad, Early Girl (it wasn't any such thing), Roma; apples: Granny Smith (we let the last of these drop, for the chickens), Mac, Transparent, and something heirloom Scottish that makes good sauce; red lettuce, bell peppers, globe and Japanese eggplant, stevia, plums (in October! ), Detroit Red beets, green and yellow zukes, Country Gentleman corn, English cukes, radishes, Yukon Gold and red potatoes, Joy Choi bok choi (which has had a fabulous year), red cabbage, basil, runner and green beans, chicken and duck eggs, Giant Head Sunflowers, Egyptian onions. Preserve Something: dried tomatoes, frozen pear sauce, more dried basil. We are now using an oil-filled radiant heater in the living room to supplement the wood stove which is in the dining room, and both have racks on them for drying stuff. 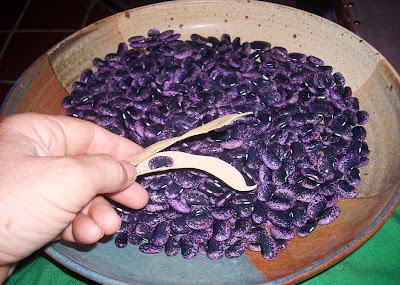 Granddaughter and I picked potatoes and beans in the rain, and I went in to put the damp beanpods in a rack over the woodstove while she picked up apple-drops for the poultry and gave them sunflower heads as well. The pears were these -- huge -- things from Florida; my mom's friend there gave me several jars of jam to bring home (stuff that grows there, exotic to us), and a bushel of pears. Talk about food miles! -- they followed me home on the back of the pickup, and all ripened at once. What we could not give away went into the freezer as pear sauce. Not all that tasty as pears go, but the sauce is good. I'll try some in bread tomorrow, and maybe make pear butter, if Granddaughter will let me stay inside long enough. Store Something: potatoes, dry beans. We'll be shelling the beans later, when the rain gets too cold to be out in. Manage Reserves: brought home a whole bunch of bubble pack for the attic crawlspace. Also the poultry feedsacks are piling up, which will be used in the crawl space to add a little R value and vapor block to the fiberglass insulation I'm rehanging there. I have ordered a pitcher pump, a foot valve, also a set of Hogue grips and a speedloader, and, for my son, a left-handed Uncle Mike's holster. Finished reading Depletion and Abundance. There's not that much in it we didn't already know, much of it from experience, and much of the rest from Carla, but it's good confirmation. But if you are just beginning to figure out that things are quickly coming to a head out there and that it's going to impact you, I highly recommend D&A as a place to begin. Cooked Something New: pear sauce. Simply used the Joy of... applesauce recipe, without sugar. 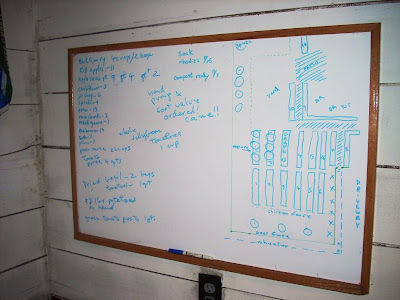 Worked on Local Food Systems: Much of the above, and selling eggs. Gave two garden tours, did some harvesting with a granddaughter. Gave away copies of Sharon's squirrelling-away list. Reduced Waste: pulling other people's cardboard and bubble packs from the waste stream. Learned a Skill: how to upload photos with the Flock Browser. Try the pre-loaded Eco-Edition. 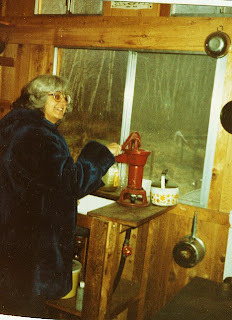 Beloved was the ideal camp cook; while we were in Lochsa, she did her grocery shopping across the Bitterroots in Missoula, Montana. Pulled into a grocery store parking lot with a mud-bespattered 4WD pickup, marched in, found the dairy manager. "I see you have eggs at 66 cents a dozen." "How many dozen? Umm, sixty, ma'am."